"A winged serpent from Gnostic lore said to bring good fortune. When equated with Aion, the god of time, it is shown with a lions head on a man"s body, and standing on a globe encircled by the signs of the zodiac." "A Lithuanian household spirit that resembles a ***** while indoors, but outdoors appears as a dragon about two feet long, with a serpentine body and four legs. In some districts is has wings and flies through the air trailing fire. It may hatch from an egg of a 9- to 12 year old rooter, and if it dies it becomes a spark. An Aitvaras will lodge itself in a house, refusing to leave. Its presence brings riches into the household, but the wealth is usually stolen from neighbors. An Aitvaras can be purchased from the Devil, but the price is the buyers soul. Once bought, it is nearly impossible to get rid of. If injured, it can be healed just by touching the ground." " A fantastic heraldic beast with a body similar to that of a wolf and the front legs and belly of a dragon. It also has long, pointed ears, a long, thin tongue and a knotted tail." " A bizarre heraldic variant of the *****atrice, depicted as a dragon-serpent with two heads, one in the usual place and the other at the end of its tail. It has birds" legs and feet and Dragon wings. Amphisaena is also a bronchial ailment caused by the ingestion of amphorae." "Beautiful feathered-plumed or serpentine Dragons similar to the AzEtc Quetzalcoatl or the Egyptian Apep. Amphiteres were reputed to posses great wisdom and knowledge, as well as some form of associated power, such as the ability to hypnotize. Many also guarded hordes of treasure, but, unlike typical treasure-hording dragons, they took on the task out of obligation rather then out of a liking of shiny things. It was said that armed men would grow from the teeth of an Amphitere planted in fertile ground, and would be absolutely loyal to the sower"
"A two-legged dragon of medieval Europe, depicted both with and without wings. Its bite causes instant death, and it is so poisonous that even touching its dead body is fatal. But it can be easily overcome by music, upon hearing which it jams its tail into one ear and press the other to the ground." "Born from the blood of Medusa"s eyes, the Basilisk is described as a monstrous serpent crowned with a dramatic frill, crestm or crown, for which it is called the "King of Serpents" It is so posionous that it leaves a wide trail of deadly venom in its wake, and its gaze is likewise leathal. It posions streams, withers forestss, and causes birds to drop out of the sky. It"s enemy is the weasel and mongoose. In actuality the Basilisk derives from the Egyptian spitting cobra, which grows to seven feet long, and sprays lethal posion from its fangs with great accuracy into the eyes of its victims. There are also small South American lizards called Basilisks, but they have none o the attributes of their legendary namesake." *In addition a serpentine Basilisk was portrayed in the Harry Potter Book / Movie: Harry Potter and the Chamber of Secrets. "A giant eel or water-snake said to inhabit secluded waters of the Scottish Highlands. Witnesses report its length at 9 to 10 feet, and it has been seen moving over land. This may be a Conger Eel which is known to attain that size. Many eels can squirm through wet grass from one pool to another. Or, it could be a typical Lake Monster." "A lake monster reported since the 19th century in Lake Erie in Canada, " South Bay Bessie" has been described as a serpentine creature, more than forty feet long, with a diamond-shaped head and humps along its back. Its colors range from ark green to black. It is also said to have a pair of long "arms,"similar to a giant squid." " A serpentine monster in the folk-lore of southern Albania. It has four legs, small wings, and faceted silver eyes. When it wakes from its year-long hibernation on St. Georges day (April 23), it devours the first human it sees. After 12 years. It metamorphoses into a horrific, fire-breathing flying dragon with nine tongues called Kulshedra. Sometimes described as an immense hairy woman with pendulous breasts. Kulshedra causes drought, requiring human sacrifice in propitiation." "In Aztec folklore of exico, this is the vast primordial Dragon from whose slain body the Earth was formed. It was depicted as a fish-like crocodile." "Originating as the serpentine Basilisk, the North African cockatrice is depicted as a rooster with a Dragons tail and bat-like wings, and so poisonous that its very glance or breath kills. It can rot the fruit on a tree from a distance, and any water from which it drinks will be polluted for centuries. It is said to be born from a chickens egg, hatched by a toad. Similar to the Basilisk, its only foe is the weasel. Both cockatrice and Basilisk derive from the Egyptian Spitting Cobra, which sprays poison from its fangs with great accuracy into the eyes of its victims. A popular heraldic beat, its name was later applied to a venomous lizard of Armenia, and a huge brass cannon of Tudor times." " Dragons of the Sahara Desert, akin to the Ying-Lung of China. They are covered with shaggy fur have dog-like heads, muzzles with profuse beards, and bat-like wings. They prey upon goats and antelope." "Depicted in classical Greco-Roman art as a great, bat-winged serpent, it was later said to inhabit caves in India and Ethiopia, where it preyed upon elephants." "In medieval European folklore, there are serpents with a womans head and breasts. The serpent in the Garden of Eden was often so Depicted." "Predatory water monsters said to inhabit the depths of the Phone River in France, where they terrorized the town of Beaucaire by dragging victims from boats. Drac is the word for Dragon in Catalan and other languages." "A gigantic reptilian creature, frequently possessing bat-like wings and fiery breath. Some are capable of human speech. There are many varieties, living in all the Elements: Earth, Water, Fire, and Air. 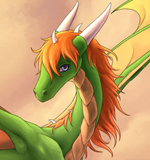 Wingless, legless dragons are called Lindorms, Wurms, or Wyrms. Those with legs but no wings are called Drakes. A Dragon with two limbs and two wings is called Wyvern. Dragons with feathery rather than leathery wings are called Amphiteres. Dragons exist in cultures the world over. Easter Dragons tend to be wise and benevolent creatures of clouds, rain, and bodies of water. Western Dragons tend to be crafty and evil, and many were slain by various heroes and knights. Some Dragons are based on known creatures, such as crocodiles, giant monitor lizards (such as the Komodo Dragon, Varanus komodoensis), the rib-winged flying lizards of Madagascar, (Draco volens), and the remains of dinosaurs. And others – such as the MokeleMbebe of the Congo swamps, or the Loch Ness Monster and its kin—may still be lurking in unexplored regions and dwelling in deep lakes throughout the world." "Great, serpentine Dragons up to 35 feet long, with one or two pairs of wings. They were said to prey on elephants. They may be derived from the Nile Crocodile (Crocodylus niloticus) or the Reticulated Python (Python reticulatus), both of which may reach that size (but neither have wings!)." "This creature of Chinese mythology resembles a horse, but has the head of a Dragon and scales instead of fur. Though some Dragon Horses can fly, none of them have wings; indeed, Dragon Horses are more often seen as water dwellers. Considered divine messengers these creatures fly between the Heavens and the Earth, revealing the meaning of the Yin/Yang symbol." "The five immortal Dragon Kings dwell under the sea in elaborate crystal palaces. One is chief over all, and the others one of the four Cardinal Directions: North, South, East, and West. Their names are Ao Ch"in, Ao Jun, Ao Kuang, and Ao Shun. They all answer to the Jade Emperor, who tells them where to distribute the rains. The Dragon Kings are said to be three to five miles long, with shaggy legs and tails and whiskered muzzles. Their slinky, serpentine bodies are covered in golden scales. It is said that when the Dragon Kings rise to the surface, waterspouts and typhoons are created, and when they take to the air, massive hurricanes result. Only the exceptional are allowed to meet with these great ocean sovereigns." "This female creature of Celtic myth enables childless couples to conceive, but requires a sacrifice in return. If she is refused, she lays a curse upon the family." "A heraldic beast with the body of a Dragon and the head of a tiger. The European take on the Asiatic Dragons." "A heraldic beast with the body of a Dragon and the head of a wolf. Another creature remnnicent of the Asian Dragons." "A wingless Dragon or Lindorm in Swedish folklore, this term may also apply to Elemental Dragons, such as Fire-Drakes, Sea-Drakes, Ice Drakes, etc. It is also used for male Dragons." “An evil giant who, with his equally foul brother Fasolt, murder their father to obtain his gold. However, there is no love lost between the brothers, for Fafner is quick to kill Fasolt to possess all of the gold. To make certain that no one ever wrests the treasure from him, the giant transforms himself into a dragon. Enter Siegfried, who not only slays the beast, but by eating his heart or bathing in his blood (depending upon the legend) is enabled to understand the language of birds. "A giant lizard monster or Dragon in the Native American legends of the Ozark mountains, which it was reported to frequent in the 19th century. As described by V. Randolf in 1951, it was said to be at least 20 feet long with boar-like tusks." "Great fire breathing, bat-winged Dragons inhabiting marshes in the British Isles and mountain caverns of northern Europe, where they guard hordes of treasure." "A monstrous serpent of medieval Christian legends, reported by travelers as being hatched from the egg of a *****atrice in the desert of Ethiopia. The mpst venomous of all serpents, it could flu as well as crawl." "A fire-spitting cosmic dragon in Seneca Indian folklore of the northeastern United States. It dwells in lakes and rivers, but flies through the night sky as a blazing meteor." "A legendary great Dragon that lived in the marshes of the Seine River and ravaged the countryside around the town of Rouen in France. It was particularly noted for causing waterspouts and upsetting boats to drown and devour boaters and fishermen. The monster was slain in the 7th century by St. Romain, then Bishop of Rouen. He tied two criminals to stakes to bait the Dragon, and when it appeared he transfixed it with his crucifix, then tired his bishop"s stole around its neck, and led it docilely into Rouen, where it was killed by the townsfolk. From that time on, all monstrous building decorations, antefixes, and waterspouts have been called Gargoyles." "Grotesque carvings of humanoid and animal monster often found on the eaves of Gothic buildings and churches throughout Europe. Originally designed as ornamental water spouts to direct rainwater clear of a wall, in medieval times they acquired religious significance as protectors of humans and averters of evil." "(also known as "fox serpent") A fresh water Lake monster dwelling in chile"s Andean ountains. In some districts it is described as a fox headed snake or a puma with the head of a fox. Its long tail terminates in a vicious claw, with which it seizes its victims. As it swallows them whole, its mouth and belly extend like those of a snake. Elsewhere, it is said to be a gigantic fish or Dragon. And yet another version says it is flat and disc-shaped, similar to a ray, but with tentacles like those of an octopus and eyes around its perimeter. A marine animal that fits the latter description very well is the Japanese Pancake Devilfish." "An enormous Sea Serpent reported dwelling in the North Sea. Black and scaly, with a long mane of hair, it is said to be 200 feet long and 20 feet thick. It inhabits coastal caves, and on summer nights it emerges onto the land to feast upon livestock." "A Spanish Dragon slain long ago, whose great green Dragon whose effigy is now paraded in the festivals of Corpus Christi in Catalona as a talisman against evil. It has a black face with rolling eyes and huge fangs in an open red mouth, from which fireworks issue to simulate its fiery breath." "A vicious French monster with the body of a snake and the horned head of a Dragon. Said to inhabit forests, pools, and swamps, it is depicted in French heraldry." "The great black tortoise of Chinese mythology, sometimes called the Black warrior of the North. Representing the North and the season of winter, it is one of the four Ssu Ling, or "Spiritual Creatures," that stand at the four corners of the Earth. The others are the Lung Wang (Dragon) in the East; theFeng Huang (Pheonix) in the South; and the Ki-Lin (Unicorn) in the West. The Black Tortoise is usually depicted as both a tortoise and a snake with the snake coiling around the tortoise." "A fabulous Japanese flying creature with the feathered wings and lower body of a bird and the head of a Dragon. They are related to the P"eng-Niao of China, and are similar to the Amphiteres of Europe and the plumed serpents of the America"s."
"A vast, all devouring Sea Serpent in the mythology of the Hurrians of ancient Mesopotamia." "A seven headed serpent of Basque legend. Although wingless, it can fly. It lives underground and devours unattended livestock." "A hideous, many-headed Dragon that dwelt in the marshes of Lerna in Argolis, Greece. A monstrous child of Echidne and Typhon, her enormous canid body sprouted nine or more heads on serpentine necks. One head was immortal, but if an of the others were cut off, two more grew back in its place. Heracles and his nephew Iolaus killed her as the second Labor, and Iolaus burned the stumps of each head that Heracles severed. The oldest images of this monster appear to depict a giant squid (Architeuthis). Hydra is also the largest of the star constellations, and was among the 48 listed by Ptolemy. The name has been applied to microscopic tentacled water creatures." " A bizarre, three headed serpent described in the Physiologus as dwelling on the banks of the Nile River in Egypt. The mortal enemy of the cocodryllus or crocodile. It is said to slather itself with mud, slip down the cocodryllus"s throat, and rip open its stomach from inside." " A Patagonian monster with the body and prehensile tail of a serpent and the foreparts of a fox. It kills its victims by constriction with its tail." ("Huge Earth-Monster," or Midgardsormen) The Midgard Serpent of iddle-Earth (Midgard), the world of humans, with its tail in its mouth. Jormangund is the second of three children of Loki and the Giantess Angrboda. The first is the Fenris Wolf, and the third is Hel, Goddess of the Underworld. Seeing that the serpent is growing fast, and knowing it will someday cause great evil, Odin throws it into the ocean that surrounds the Earth where it eventually encircles the whole world. At the time of Ragnarök, Jormagand and Thor will destroy each other." “One of the most important of the Mayan gods. Pictured as a feathered serpent, Kukulcan was actually the chief god of many of the later Mayans. "The final state of metamorphosis of the Albanian Bolla. Usually appearing as a nine-tongued, fire breathing dragon, it can also appear to be a hairy old woman with pendulous breasts. It causes droughts, the cessation of which requires propitiary sacrifices." "A creature of South Korean folklore that resembles a cross between a chicken and a Dragon. (much like a *****atrice). In a mountain by this name, there is a pool in which the female Kyeryong dwells. Women shamans bathe in this pool to obtain magickal powers. Alyeong, the first queen of Shilla, was said to be the child of a Kyeryong." "A Mongolian Dragon with a serpentine body and a leonine hed and forequarters, quite similar to the European Tatzelwurm"
"(Swedish, "Dragon"); also Lindworm or Lindorm) Gigantic serpentine invertebrate from Germanic and Scandinavian legend, sometimes dipicted with small wings, but incapable of flight. Numerous witnesses over the centuries describe the creature as being 10 to 20 feet long, with an unwieldy, legless body as thick as a man"s thigh and black or green-gold in color, and a yellow-flamed belly. It has a horselike head and mane, a mouth full of sharp white teeth, and large, glowing red eyes. Very aggressive and able to attain great speed, it can take down a man on a galloping horse. When killed by Marco Polo, who encountered these creatures crossing the steppes of Central Asia, they began appearing in Europe during the Middle Ages. Although the Asian variety thrived on dry land, the European subspecies preferred marshes and streams. They haunted churchyards, and ancient burial mounds, guarding their treasures and living on decaying human remains, symbolizing war and pestilence, they devoured cattle and people." "The chinese word for Dragons, especially the five toed Imperial Dragons, gaurdians of the Earth"s waters. They inhabit the rain clouds and breathe smoke and flames from their nostrils. Each holds a pearl of wisdom in it"s open mouth, and each has a particular area of responsibility. (denoted by the word that precedes Lung). For example, Shen Lung, the Spiritual Dragon is the beautiful, multicolored five toed Imperial Dragon of China and the master of the wind-borne rains. Only the Emperor of China was allowed to wear his image – others were forbidden, under penalty of death. Lung Wang, the Azure Dragon, is the Dragon king. Representing the East and the season of spring, he is one of the four Ssu Ling, or "Spiritual Creatures" that stand at the four corners of the Earth." "A large, dark, manlike creature with wings, first reported at the beginning of 1926, when it was seen hovering over one of the worlds largest dams, the Xiaon Te Dam in southeastern foothills of China. On January 19, 1926, the dam collapsed, spilling more then 40 billion gallons of water onto the farms and villages below and killing more then 15,000 people. Survivors came to believe that the Man-Dragon"s appearance had been intended as a warning." “The name of a snake which lives on the Malayan Peninsula, and of a dragon that swells in its lakes. According to ancient legends, the lakes were created by an old man--also named Nagaq—who drove his staff into the ground and created holes from which water rose. "An immense, winged white dragon of Japanese legend that dwells in the waters of Yamahiro. Every fifty years it metamorphoses into a golden bird with the haunting cry like the howl of a wolf. This periodic transformation and howling presages disasters, such as famine"
"An enormous Dragon or Lake-Monster said to have gouged the channel of the Shannon River in Ireland. Generally benign, it became enraged upon learning that St. Patrick was coming to exorcise it, and swallowed a drunken piper, who continued to play inside the monster"s belly until the beast disgorged him in disgust." "(Norse Ormr, "Dragon"; or Worm, Vurm, Wyrm) This is a general term for serpentine dragons, especially those that are wingless and legless. Since F.W. Holiday"s book, The Great Orm of Loch Ness (1968), it has come to be applied to lake monsters, especially those thought to be invertebrates." In Egyptian mythology, this is the vast serpent of eternity that, in an endless cycle of destruction and renewal continually consumes its own tail as it grows longer at the front end. It frequently appears in alchemical illustrations to symbolize cyclicality and primordial unity. It is thought to have been inspired by the Milky Way, as some ancient texts refer to a serpent of light residing in the heavens." "Bird dragons of Chinese myth. They either have the head of a Dragon and the wings and lower body of a bird, or a completely serpentine body, with feathered scales and birdlike wings, legs, and feet." "A creature of local legend dating back to 1673 when Father Jacques Marquette, in recording his famous journey down the Mississippi River with Lousis Joliet, described the Pisa as a grotesque monster painted high on the bluffs along the Mississippi River, where the city of Alton, Illinois, now stands. According to Marquette"s diary, the Piasa "was as large as a calf with horns like a deer, red eyes, a beard like a tiger"s a face like a man, the body covered with green, red and black scales and a tail so long it passed around the body, over the head and between the legs"
"This Chinese deity of rivers is part Dragon, part horse." The Greek dragon whose name now signifies a species of large constrictor. In mythology, Python is a huge female serpent sent by Hera to plague Leto as she is in labor with Apollo and Artemis—the children of Hera"s husband, Zeus. "The great cosmic feathered serpent and culture hero of Mesoamerican legend. He is credited with creating and fertilizing the Earth, and introducing agriculture and civilization to people. His symbols are lightning, thunder, and thunderbolts (meteorites). When a comet appeared, it was considered to be him. The myths often describe him as the divine ruler of the mythical Toltecs, who after his expulsion from Tullan, travel south or east to set up new cities and kingdoms. Many different Mesoamerican cultures -- Such as the aya, K"iche, Pipil, and Zapotec – claim to be the only true descendants of Quetzalcoatl and thus of the Toltecs." "A winged serpent with the head of a Dragon, from medieval bestiaries. She dwells high above the clouds and is rarely seen on Earth, as she spends all her time flying and never comes to rest. As she soars on high, she lays her eggs, which hatch while they are falling. Only the shells reach the ground, and if part of a shell is eaten by an animal, the poor creature will go mad." "Brilliant-colored lizards or small Dragons that can live in flames and molten lava, and so cold that they are able to extinguish fires. Fireproof asbestos fibers were said to be "salamander wool." Paracelsus (1493-1541) gave their name to Fire Elementals. These myths are based on the European Fire Salamander, which hibernates in dead wood, often ending up in the fire place as it crawls out of the logs, awakened by the heat. When frightened, it exudes a harmless milky fluid that can actually extinguish weak flames. The Salamandra sometimes appears as a symbol for fire insurance. It is also said to be poisonous, and it is true that many newts secrete potent tetrodotoxins through their skin as a defense against predators." "A serpentine winged Dragon with only two front legs, and multicolored scales so beautiful that animals and humans stop to admire it. -- whereupon the sluggish reptile strikes them down and devours them. Its poison is so fiery that anyone it bites is consumed in flames, It glows with such inner heat that even in a severe frist, it will come out of its den to shed its skin, T.H.White sugggests that is may be the "superbly marked" Rhinoceros Viper (Bitis nasicornis), found in the forests of West and Central Africa." "A heraldic beast with the foreparts of a dragon and a fish"s tail. The name has been given to the Leafy Sea Dragon. (Phycodurus eques) and the Weedy Sea Dragon (phyllopteryx taeniolatus), both of them charming little fishes related to the Seahorse. (Hippocampus), which are decorated with leafy projections to camouflage them among seaweed." "A terrible bird dragon of Icelandic legend. Sometimes described as a crowned and winged serpent, its stare is leathal to all, including its own species. When two Skoffins meet, they both die. They can only be killed by silver bullets into which a cross has been cut." "The Great Cosmic World Serpent of dragon of ancient Mesopotamian mythology, equated with salt water and the Milky Way. She has a vast, invincible body, with two forelegs, two great horns on her head, and an enormous tail. In the Babylonian epic, the Enuma Elish, she and her consort Apsu/Abzu (personifying fresh water) create the heavens and the Earth and engender the gods, who rebel against them. Tiamet is slain by Marduk and her body dismembered to provide lands and stars. Her flowing blood becomes rivers." "A massive reptilian quadruped, or dragon, of Inuit legend. It has two leathery "feelers" and a colossal set of jaws, which it uses to ensnare it"s victims"
"A giant, fire breathing dragon of Greek myth, taller then a mountain, with serpentine arms and legs, bird wings, and 9, 50, or 100 snakelike heads whose eyes blaze fire. He was eventually overcome by Zeus in the Battle of the Titans and imprisoned in Tartarus, deep beneath t.
Aetna, where his convulsions are said to cause typhoons. On Echinda, he fathered such monsters as Cerberus, the Chimera, the Hydra, the Sphinx, the Nemean Lion, and the vulture/eagle that ate Prometheus" liver." "A giant, winged water-serpent of Tennesee and the Carolina"s. It bears a precious gem upon its horned head, but no one can take it, for the monsters very breath is deadly to all creatures." "A monstrous flying serpent of Japanese legend, sometimes portrayed with wings, sometimeswithout. It flew down and scooped up human victims in its enormous jaws, until it was slain by the hero Yegara-no-Heida." "A peculiarly French variation of the Wyvern, depicted as a dragon with the head and breasts of a beautiful woman. She sees by means of a ruby, garnet, or diamond, set between her blind eyes. This magickal gem is coveted by sorcerers, who attempt to steal it while she is sleeping or bathing. The vouivre inhabits mountainous regions, lurking behind ruined castles or monasteries, where she guards hoards of treasure. She will only attack a clothed person, so the best defense is to strip naked, whereupon she will flee." "a serpentine water-monster in the traditions of the Algonquin and Maliseet-Passamaquoddy Indians of the eastern United States. It is variously described as a giant worm, a stag-antlered water-serpent, a great spiny sturgeon, or a crocodilian sea monster with huge horns. It lurks in rushing waters, such as waterfalls, rapids, and whirlpools. Its horns contain all its power, conferring great courage and magick upon anyone who can manage to take scrapings of them." "A common term for evil serpentine dragons in regions of the British Isles that were settled by Vikings a millennium ago. Worms inhabit foul, dank, places, such as boggy marshes, fetid lakes, and wells. They prefer hidden lairs near swamp lakes that connect with the sea at high tide, thus allowing these monsters to pass from one environment to the other. Their heads are like those of dragons or horses, with huge bulging eyes, great fangs, and often horns." "A kind of flying serpentine dragon with bat wings, two avian hind legs, with eagle talons, and a long barbed tail. Basically, it resembles a Pterosaur, such as ramphohynchus. One variant is the Sea-Wyvern, which has the tail of a fish. Wyverns have been described as the largest form of dragon, able to prey on such huge creatures as elephants and rhinos. In heraldry, the wyvern symbolizes war, pestilence, envy, and viciousness. The default coloration of a heraldic wyvern is green with a red chest, belly, and under-wings." "Rather unique Chinese dragons with fur instead of scales, and usually with feathered wings as well. They are guardians of the waters of the Earth and the clouds of the heavens." "In Chinese mythology, a dragon with the fins and tail of a fish. Originally a celestial carp, it is transformed after leaping the Dragons Gate waterfall and flying to heaven. It represents high aspirations and success in examinations."